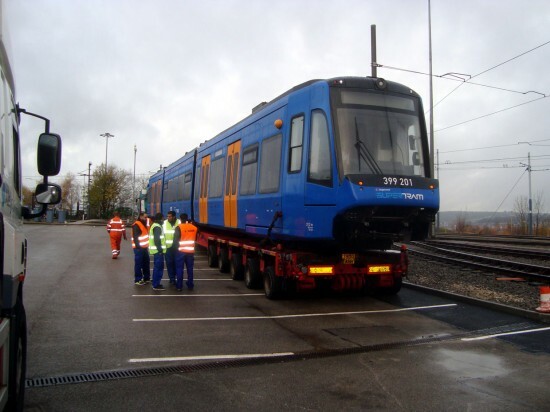 At 2140 on Monday 30th November a little piece of history was made when the very first tram train arrived at its new home following a lengthy journey from Spain. 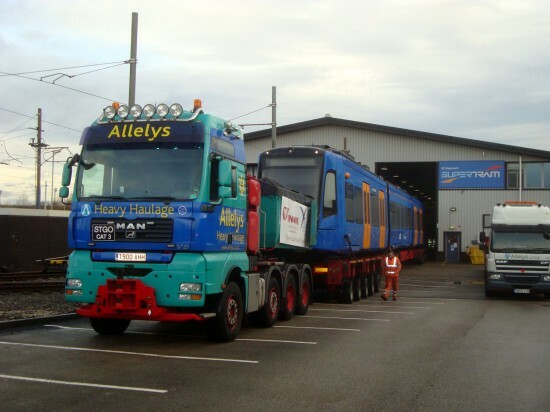 The Vossloh built vehicle arrived on the back of a Allelys low loader in the dark and was driven into the confines of Nunnery Square Depot and spent its first night in South Yorkshire awaiting unloading. 399 201 had left the Valencia works of Vossloh ten days earlier and made its way to Sheffield via boat from Santander to Southampton and was then driven up the country via the M1 before arriving in the steel city. Following arrival at Nunnery Square the tram train spent one more night on the low loader before it was unloaded the following morning. The vehicle will now be fully commissioned and tested with this process likely to take many months. There are seven on order of which four will be required for the tram train service to Rotherham with the rest to aid capacity on the current Supertram network. It is expected that the latter three will enter service ahead of the opening of the tram train service in early 2017. This entry was posted in Stagecoach Supertram. Bookmark the permalink. Cant wait to see it/them in operation. Historic moment which hopefully will be the catalyst for Tram-Train technology to demonstrate it can and will form part of transport offering. Certainly areas in the country that will be watching with interest. I would be interested to know if these vehicles are dual voltage, what modification Network Rail had incorporated eg front end crash resistance and will there be any stops on Network Rail track’s. The units are dual voltage, construction of the chord at Tinsley is scheduled to start next spring and the line to Parkgate will be electrified throughout at 25kV. Tram platforms will be built at Rotherham Central and Parkgate. There will be an in depth article on the Tram-Train project in the 9th December issue of RAIL magazine. Thought the line to Parkgate was being electrified at 750v DC the same as the Supertram network and that the trams were built to run off 25kv AC to avoid conflict when the Midland Mainline is electrified at 25kv AC and could be extended to Rotherham at a later date. Will a yellow front be added later I wonder? As I understand it, the group standards for use on BR no longer require a yellow end subject to a high enough standard of headlight being fitted. Being new vehicles, I would imagine that the headlight does meet said standards. Of course, this doesn’t prevent a yellow end, just means it is no longer mandated. Just to protest at the ridiculously sharp curves planned for the connection between the two lines near Meadowhall which trams will have to grind around at a crawl. So trams will be slow and not be able to compete with trains for speed, which is daft – there are enough right-angles curves on the Meadowhall line from the city centre as it is!!. One access curve is hardly going to cause massive delays! Are they competing or is it simply to allow better through running? The layout is similar to the existing trams with doors in each end-section only. Presumably the centre section is also low-height inside with stub axle bogies, rather than traditional bogies like the Siemens trams. The end-bogies will be traditional types under the driver. With the route from Cathedral to Rotherham being 750V all the way it will not be possible to get experience with dual-voltage operation and there is no other system in the country with 25KV to test on. I wonder if they might take one to Old Dalby test track to check this and the signalling. I also wonder if one might be loaned to other systems interested in tram-trains. It would be better to electrify the Rotherham line to standard BR 25KV AC to get some real experience with the mode and the changeover of voltage. Just to clarify the observation on yellow warning ends. Yellow warning panels on railway vehicles are obligatory where the railway vehicles lighting do not fulfil part 3 ‘Requirements for Visibility of Trains’ of the railway group standard. These requirements are highly unlikely to be achieved on older trains, but may apply to newer ones, and tram trains. In addition it is not solely the type of light but a combination of lighting features that are applicable.